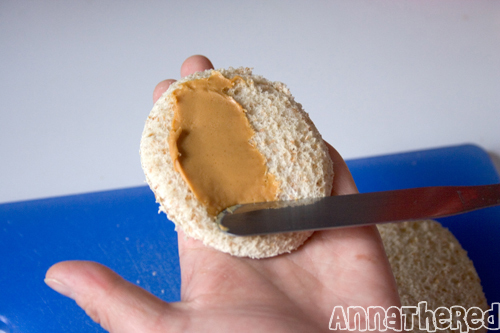 My boyfriend loves eating peanut butter sandwiches as a snack. He eats one before he goes to kung fu class on Saturday or late afternoon on Sunday. I was thinking there’s gotta be an easy way to make his plain peanut butter sandwich cuter. Easy and cute = Totoro!Â So I was looking around the house, thinking what I could use to make a sandwich cutter for Totoro… a soda bottle! 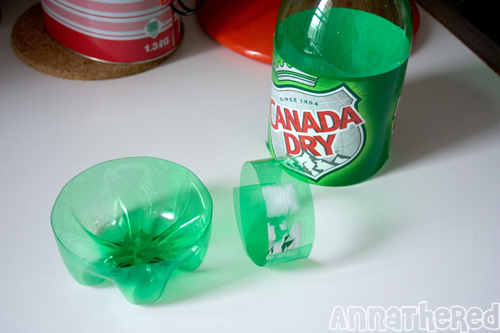 Please be careful with the sharp edge and a knife when you start cutting up a soda bottle. I’d feel horrible if anyone cut themselves doing this. 1. I washed an empty 2 liter soda bottle, and cut a strip about 1 inch to 1 1/2 inches wide. Trimmed one side and make sure that it was straight. (I wouldn’t make it any wider, though. It’ll be harder to push it down on bread) I left the label on when I cut it. It’ll act like a guide to cut a straight line. 2. Take the crust off the bread. You’ll use the crust later, so don’t eat it yet. 3. 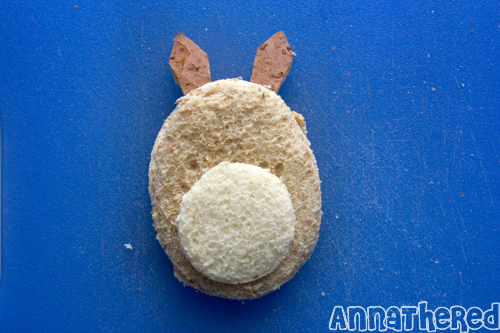 Put the plastic cutter on the bread, and decide how big you want your Totoro to be. 5. Try holding it like an egg or oval shape (or circle if you find cutting an egg or oval shape is hard) over a single slice of bread. 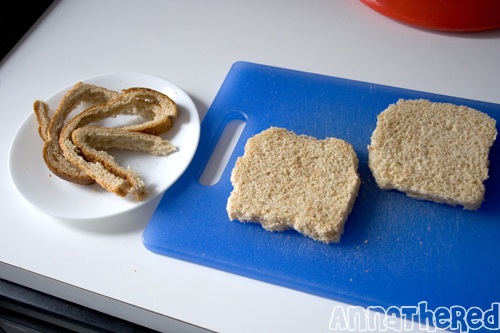 I tried doing two slices of bread at once, and it didn’t work. My laziness has proven that it’d be a lot easier to do one by one. 6. 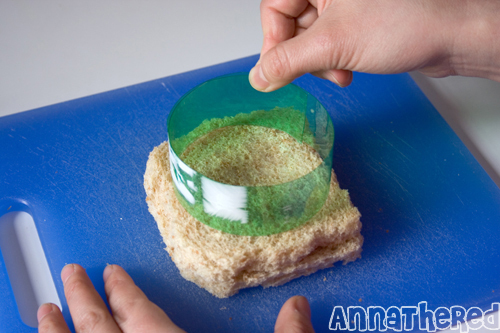 Place your palm over the cutter, press it down, and hold it for a little bit. Be careful not to cut your hand. 7. Take the paper clips off from the plastic cutter, and make the round shape smaller for Totoro’s stomach and put together with paper clips. 8. Put the cutter over white bread (or cheese), and place your palm over the cutter and press it down, and hold it for a little bit. Be careful not to cut your hand! 9. Cut the crust into diamond shapes for Totoro’s ears, triangles for Totoro’s stomach, thin strips for Totoro’s whiskers, and a small squareÂ shape for Totoro’s mouth. 10. 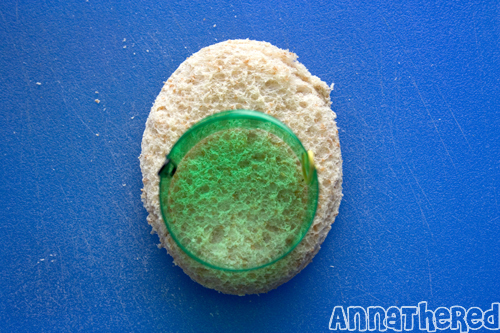 For eyes, you can use a round plastic cap to cut out white bread (I used the cap from an insulin syringe. My cat is diabetic, so I have bunch of them. 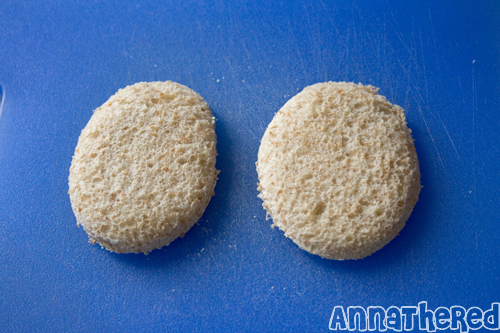 ), or you can squeeze bread to make a ball and squeeze it flat. If you have a really big straw, like the one they use for Chinese bubble tea (boba tea), that would probably be the best. Or you can use cheese. 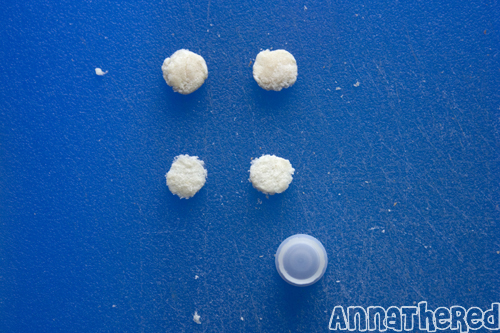 The top ones are squeezed bread balls, the bottom ones are cut out with a plastic cap. 11. 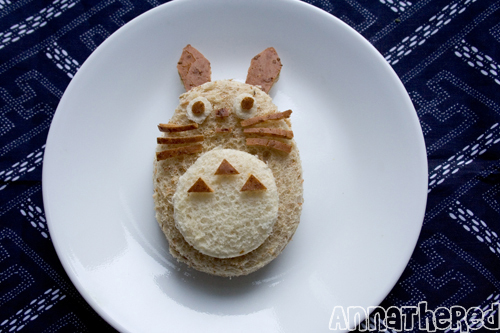 Use a straw to cut out crust for Totoro’s eyes. I tried to make this sandwich with using a minimum of ingredients, so making the face parts with crust may be tricky if you aren’t too crafty.Â And of course, it doesn’t have to be a peanut butter sandwich either. 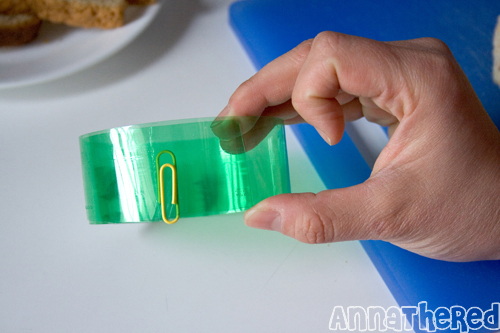 I used it because I always have it in my house, and it’s easier to use it as glue than jelly. I think you can easily replace the face parts with different kind of vegetables, or chocolate in a tube. Mmmmm chocolate… I think I’m gonna have to try it next. You made your own cutter! LOL! I’m the lazy type who will just buy one. My daughter loves Totoro, so this is going in her lunch on Wednesday (no school tomorrow). omg! I love this so much!!! 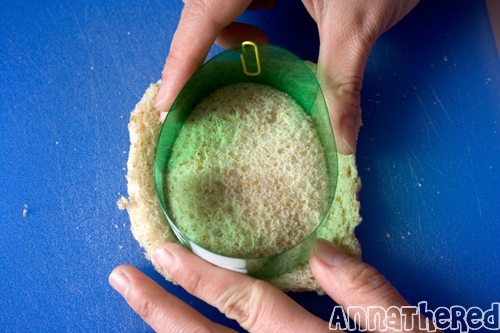 My friends kid has been desperate for a Wall-E sandwich and when he sees this he is going to go crazy!!! Thanks so much for sharing all your ideas I’m going to give them ago when I have some time! Cute! Hey, it sounds pretty easy, too, and not as time consuming as some of the other stuff you do. Sounds like my kind kyaraben (I’m so not a morning person, so I do quickie bento)! i don’t understand.. what is the paperclip for??? oh sorry, i understand now… the plastic is not round…. Thanks so much for that! I just finished making one for a snack. 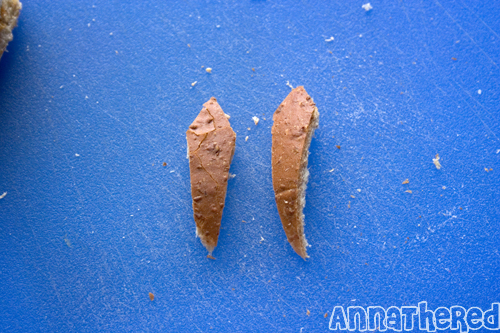 I was also too lazy to cute the crust into nice shapes so, I piped nutella onto the bread. Like Icing! You are amazing. Your boyfriend is the luckiest man on earth.